Indications: Anti-depressant in the SSRI (selective serotonin reuptake inhibitor) family. May be prescribed off label for other uses. Summary Recommendations: Escitalopram is an antidepressant and should be taken as prescribed even if you find out you're pregnant. Your doctor will need to work with you to reduce the daily dose and replace the drug with another treatment to protect against possible pregnancy/fetal complications. The brand name for escitalopram is Lexapro. General Precautions: As is the case with all SSRIs, it may not be safe to take Lexapro with other drugs used to treat mental illness. If you are currently taking any prescription medications, including by not limited to antidepressant, antianxiety or antipsychotic medications, tell your physician immediately before taking the first dose of Lexapro. SSRIs are associated with fetal complications and birth defects when used throughout pregnancy, but especially during the last trimester. The manufacturer of the drug has reported cases of spontaneous abortion with use of Celexa, another SSRI antidepressant from the same family, including Lexapro. When taking an antidepressant like Lexapro, you should never stop taking the drug without consent and guidance of a physician. Lexapro affects chemicals in the brain that alter mood. Withdrawal symptoms may occur so your physician may reduce your dose before changing your medication. Effects While Trying to Conceive: We found no reports of impaired fertility in humans after taking Lexapro. Animal studies show reduced mating at all doses, reduced fertility at doses higher than 32 mg/kg/day and prolonged gestation in female species at doses higher than 48 mg/kg/day. These doses are well in excess of the recommended health doses for humans. Effects on Pregnancy: There have been no human studies on the effects of Lexapro on the fetus or pregnancy, but verifiable reports of fetal complications and birth defects have been noted by the manufacturer and the Food and Drug Administration. 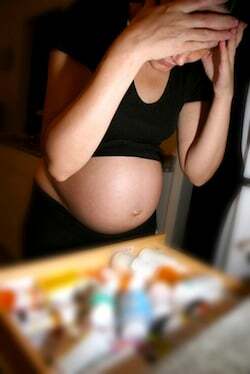 Some complications associated with Lexapro (or SSRI) use during pregnancy include weight loss and reduced feeding. These side effects could affect the overall health and well-being of the infant. In at least one case, an infant born to a mother taking Lexapro during pregnancy developed heart and/or lung problems. Safe During Breastfeeding: Lexapro is not considered safe for use during breastfeeding if there is another drug that can help the patient achieve optimal mental health. The drug is passed to the infant in breast milk. There have been multiple reports of weight loss and decreased feeding when the breastfeeding mother was taking Lexapro.